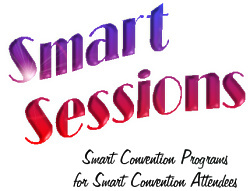 SmartSessions™ feature informative content from our acclaimed seminars, providing attendees with a memorable convention experience. 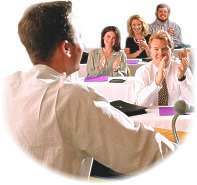 SmartSessions™ are informative, fast-paced, fun, and economical. Absolute Audience Satisfaction: SmartSessions™ showcase the most popular segments of our hottest seminars, facilitated by our most accomplished public speakers. Your convention attendees will benefit from proven, informative and fun learning programs. Easy Scheduling: Our agenda-friendly convention and conference programs are ready to roll. Give us a date and we’ll send our best. There’s no easier way to enhance your convention with high-quality content. Reasonable, Fully Bundled Pricing: We guarantee free instructor travel and free instructor expenses. You’ll pay only a modest speaker fee. Your costs are not only reasonable, they’re predictable: You’ll know the exact cost in advance. Agenda Friendliness: Each Smart Session adapts to a 45 to 75 minute agenda window. We’re flexible enough to fill a range of time slots, allowing you to time-out your days easily. And with one versatile facilitator, we can fill as many as four agenda slots in a day.